My very first Inktober drawing. I used two different Pentel brush pens to do all of the inking (with a little help from a Signo gel pen for the white bubbles). 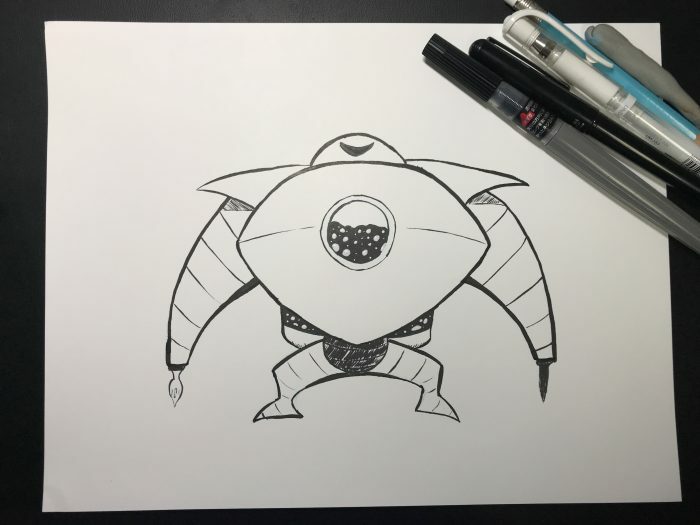 I can’t take credit for the overall design – it’s heavily based on a robot design from Christopher Hart, but I added in the ink specific alterations. It’s not the best drawing, but considering I’ve done very little drawing in the last 15+ years, I’m pretty happy with the result. I’ve never tried to draw anything this large, so it was interesting going from 1″ doodles to a drawing that takes up half of an 8.5″ x 11″.